“If you ever write about this, name it The Search For A Perfect Thangka,” says Norbu, my guide, and displays his pearly whites in a smile. After driving me around for almost two hours in a near-deserted city centre, where even the residents leave town in the biting winters, he has been amused with my obsession, first to visit Ladakh at this time of the year and second to find that perfect piece of art to take back home. At Moti Market, he pointed me to every shop that was possibly open with a hope that I will find what I am looking for. His amusement began earlier in the day while rattling off his pieces of local knowledge, he had pointed to an animal on the road and mentioned, “that’s a Dzo, it’s a cross between a yak and a cow and they are infertile.” In my absentmindedness, I had ended up asking him “infertile, really? So how are there so many of them here?” Norbu had given me a deadpan look as if saying “how dumb are you and what did I just say!” followed by peals of laughter from both of us. At only six o’clock in the evening, the shop shutters are being brought down and the Kashmiri men with their portable barbecues are starting up the fire on the roadside. Their business begins now by serving melt-in-the-mouth mutton kababs on a bed of soft naans. Charcoal is prepped up, meat is assembled on skewers, spices and butter are basted on, and finally, a mix of crackling noise with savoury aromas waft through the streets, as the skewers touch the heated spit. He takes a sharp turn from the road we are on and starts navigating through inner by-lanes of the city until we emerge onto another main road. A small shop with a fluorescent white bulb is the only place open in the area. Norbu stops the car and calls out to the proprietor, Chongjor. A middle-aged man packed in a sweater, half-jacket, and light blue jeans with shoulder-length hair steps out of the shop. They exchange some words in Tibetan and Chongjor waves at me to come inside. “I usually supply the paintings for the thangkas and do not have any readymade ones. If you want to look at the art and select the one you like, I can get my tailor to make you one now, but it will take about half an hour” says Chongjor. I am delighted at the prospect of having a customised thangka and reply, “that would be really lovely, I cannot thank you enough for taking this trouble.” Chongjor dismisses my gratitude with a wave of his hand and a smile. I start sifting through the files of artwork on display on a wooden bench at the far end of the shop. The delicate papers are painted with vibrant colours depicting Goddess Tara, Avalokiteshwara, Healing Buddha, and numerous other pantheon of Tibetan deities. The fine brush strokes have a hint of gold in them as is the custom to paint these artworks. While I am trying to decide, Chongjor goes into the curtained room behind the shop and returns with a heap of patterned silk cloth. Norbu has busied himself in another corner picking up discarded bits of cloth in various colours. 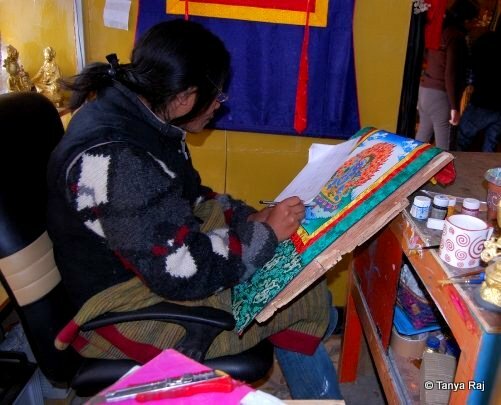 Chongjor works on a thangka artwork. He looks up and responds with a tease, “stop asking questions and help me gather more cloth pieces.” I laugh at his attempt to be assertive that betrays his otherwise soft, angelic face. “Sir, yes sir!” I say playing along, at which he lets out a hoarse laugh. “Only small pieces and see if you can find any in nice shades of blue” he provides specific instructions. “What is it for, may I ask?” I say even as a start peering through the jumble of cloth bits on the floor. “That is so sweet, Norbu” I remark and turn around to look at him as a smile starts building up on my face. “Yes, she prefers my handmade jewellery to the ones from the shops. Sometimes I make them with beads, but I prefer making it out of cloth, and small pieces make it easier to work with” he continues. “What are their names?” I ask. “Sonam and Rinzen,” he replies. “Sonam is pregnant with our second child so I thought it will make her happy to get a gift” he finishes with a beaming face. “I absolutely agree! You are really thoughtful and caring” I respond with admiration to this simple man who has been my guide for the last couple of days.